If you work from a home office most of the time, things can start to feel a bit dull before long. There might come a time when you want to work on freelance writing projects pretty much anywhere else just for a change of scenery. You could take the traditional routes of office-sharing, working in cafes, or writing from your local library (a great option if you want quiet and minimal distractions). This year I decided to do something a bit different. To say I've been in a rut this year is a massive understatement. It's not that I can't get through my work. I just don't care much. I don't feel inspired. And working at home reminds me of things that upset and distract me. So I wanted to get away. I love the outdoors (though with my allergies they don't love me back quite so much). And there's a lovely garden about an hour and a half from me. Normally I go once a year. 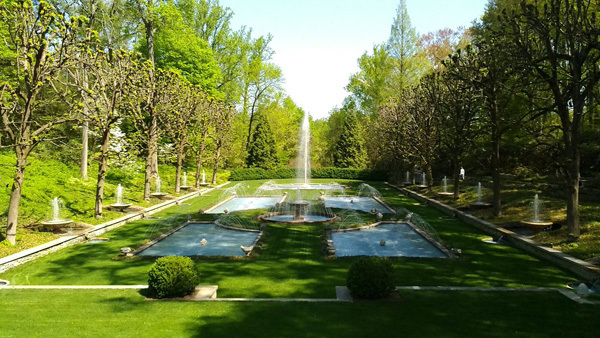 But I opted for a yearly membership this time, figuring for once I'll go repeatedly and see how the gardens change throughout the seasons. Last week I went to scout some potential spots to hang out -- to work on freelance projects, to write poetry, to work on fiction, to draw, and to paint. And weather-permitting, I'm planning to make this a 1-2 times per week working spot just to get away from here a little more often. 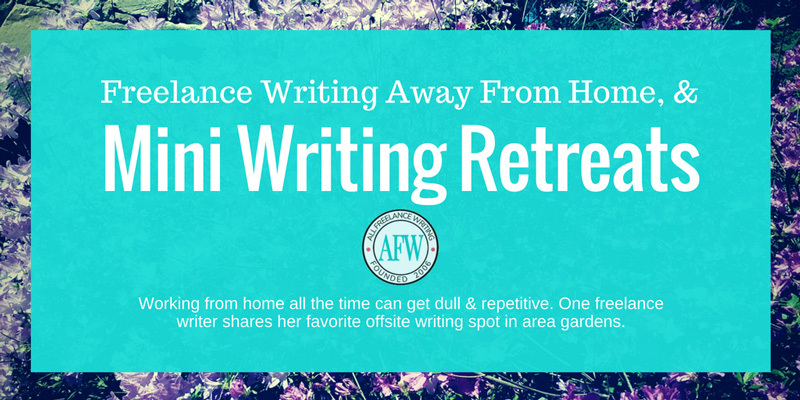 Today I'd like to share those gardens with you as an example of the less-typical kinds of places where you can get away too, either for a few hours of writing or a mini writing retreat. This was the first time I can remember being there for the earlier spring displays. There are benches spread throughout the nearly 1100 acres, and the views will change all season long. This is my favorite time of spring -- when all the purples and yellows start giving way to pinks, before the richer summer hues make their appearance. 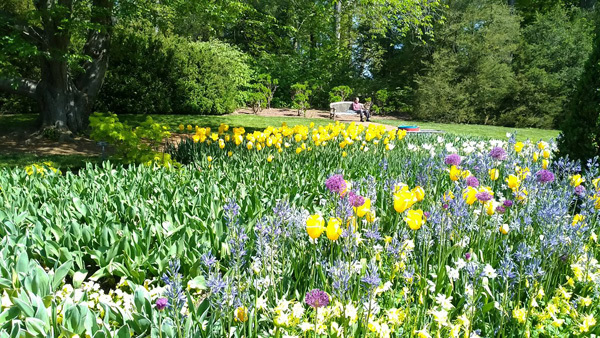 These spots, full of blooms, are a great place to seek inspiration or turn your attention to photography or art to get your creative juices flowing again. Walking past those gardens, you'll go through some trees to come out at the edge of a pond. I've seen some incredible egrets hanging out in this little nook by the water in summers past. Walk a little further and you'll find plenty of open lawn along the edge of the pond (one of several on the property). It's a nice place to lie out a while and think while you soak up some sun. And it's surprisingly quiet (the nearby treehouse tends to distract families in this area, making this a rather peaceful spot). 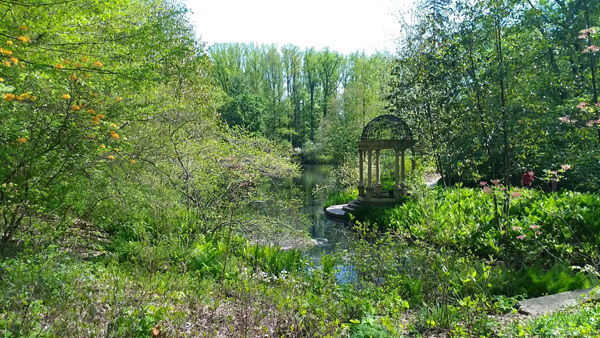 If you go just beyond the pond, you'll find it sits above a formal Italian water garden. 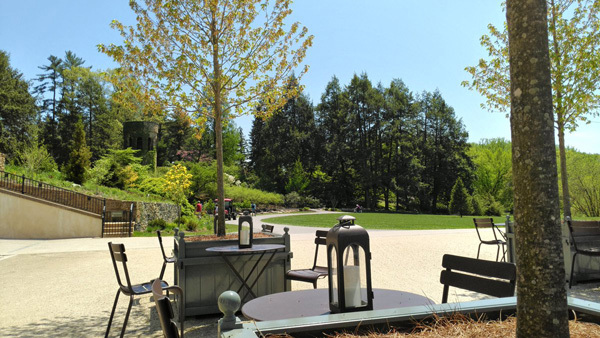 It's one of my favorite places in the gardens, and it's a delightfully shady area with benches both above and in the trees off to the side, perfect for working on poetry or otherwise writing by hand on a hot summer day. 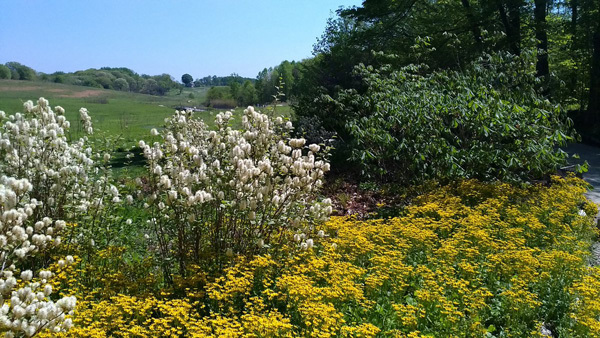 While over in this area, you can walk the open meadows behind the formal gardens, or take a stroll through the woods just beyond that. It's a nice way to think things through before sitting down to write. Then back on the other side of the property you'll find the conservatory -- perfect for a rainy day when you want to be around nature but stay dry to work. 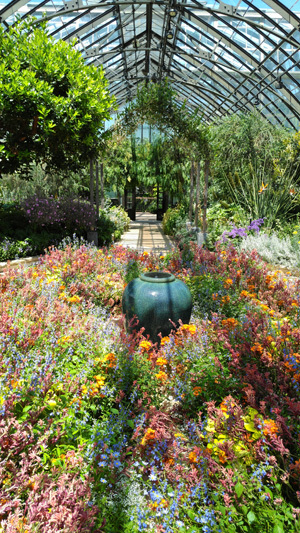 You'll find more lovely flower displays like the ones below or the orchid house. There are also humid palm displays, a banana house, an arrid house, bonzai displays, a lily pond courtyard in the summer, and plenty of open space to simply relax. And the gardens are open through Christmas with gorgeous holiday displays, so the conservatory will be a nice way to spend some cold days after the autumn color fades. 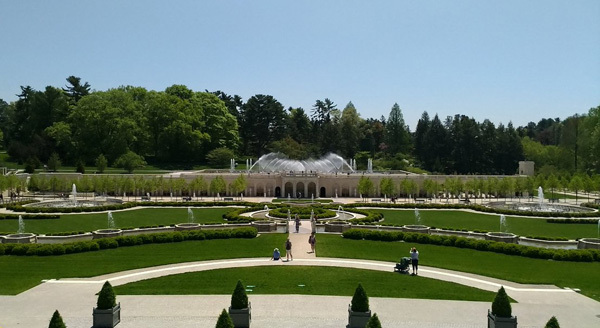 If you walk out the front of the conservatory, you'll find yourself above a spectacular fountain display. If you're lucky, you might even catch one of the fountain shows. With the classical music blaring in the background, it's almost exhilarating compared to the calm of the rest of the gardens. I caught this video as I was approaching from beyond the topiary garden. 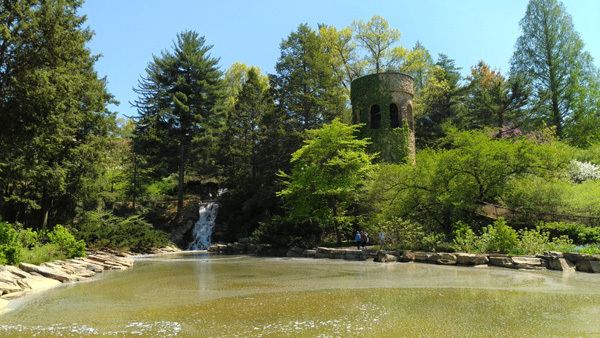 But then, if you walk to the other side of the fountains, you'll find my favorite area -- the chimes tower and waterfall. 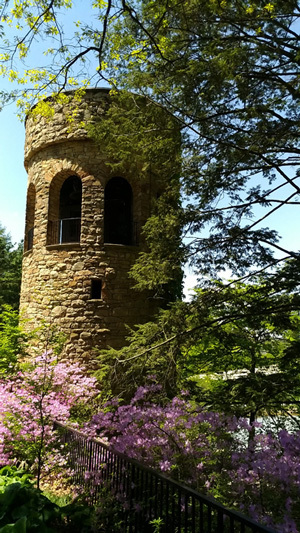 The tower itself is lovely, though my favorite spots are the benches near the top of the waterfall, where the roaring of the water drowns out everything else and leaves me alone in my head to write. While not as exciting, I also found a spot just a bit away from the tower that's perfect for really diving into freelance projects -- tables and chairs in an area where no one seemed to want to be in the mornings. 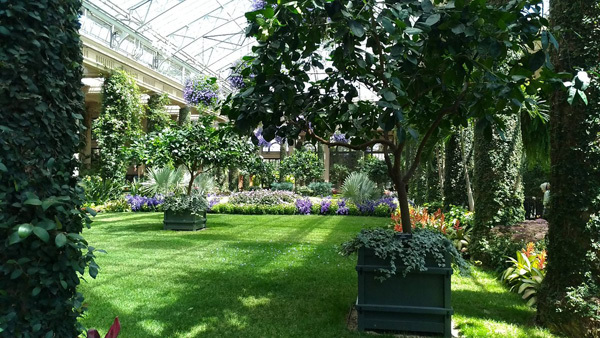 I imagine this is where I'll spend most of my writing time while here, heading into the conservatory or water garden shade when it's raining or too hot. Coupled with some inspiring walks around the gardens when I need to stretch my legs, I can't think of a better place to work. I only wish it was close enough to go every day. It might make me a willing commuter again. Now don't get me wrong. I like my home office. If I wasn't constantly looking for distractions these days, I'd be content rolling out of bed and into my writing each day. But when you do need a change of pace, it helps to have somewhere inspiring to go. I'm lucky to have a place like this close enough that I can make it an occasional writing spot. You probably have similar if you look and get a bit creative. Another spot I like is my favorite B&B in a historic mansion in a small city nearby. Sometimes (pretty rarely) I'll get a room for a night or two in the library suite. It has a gorgeous separate sitting room with an old fashioned writing desk. One of my favorite birthdays was spent sitting at that desk watching the snow fall on the city outside the window in front of me while working on a manuscript. If you want to make a weekend of it, any hotel or B&B will do. Or even consider house-swapping for a night or two with a friend or family member. And you don't need botanical gardens or other formal displays. 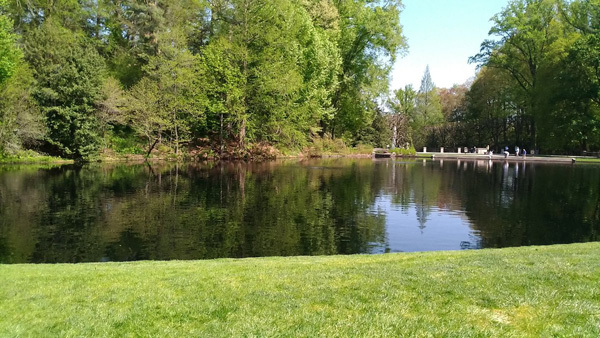 You can probably find a lovely spot to write at a favorite park -- mine has benches along a small lake that are nice when it's quiet. A picnic table could be a good place to hang out and work on a laptop for a while. You could also look at museums, outdoor monuments -- anything of interest near you that maybe you take for granted. 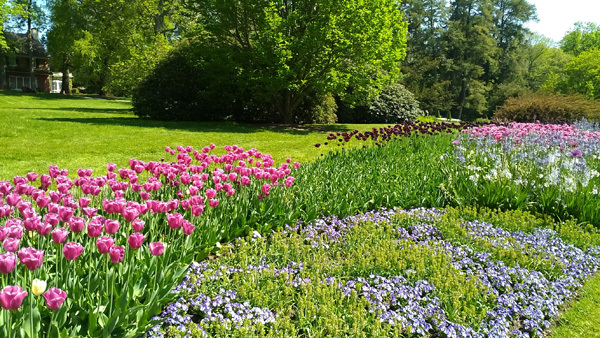 While I have one more trip to the gardens before I settle in there for routine writing (to do a poison plant hunt as research and inspiration for the murder mystery series I'm writing), I can't wait to get out of my office, get outdoors, and basically just be anywhere but here a little more. With any luck, I'll have some nice extended writing days and more time to work on creative projects like poetry and painting (the latter which I'm tying to some of my fiction anyway). 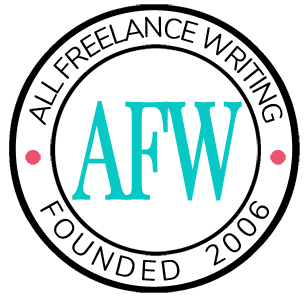 Now tell me... if you want to do freelance writing, or creative writing, away from your usual home office or work space, where do you like to go? Is there somewhere nearby where you've never thought to write that might be an unusual or inspiring place to write?